The USS North Carolina (BB-55) “Showboat” was the lead ship of North Carolina-class battleships and the fourth warship in the U.S. Navy to be named in honor of the State of North Carolina. She was the first newly-constructed American battleship to enter service during World War II, and she took part in every major naval offensive in the Pacific Theater of Operations to become the most highly decorated American battleship of World War II, accumulating 15 battle stars. 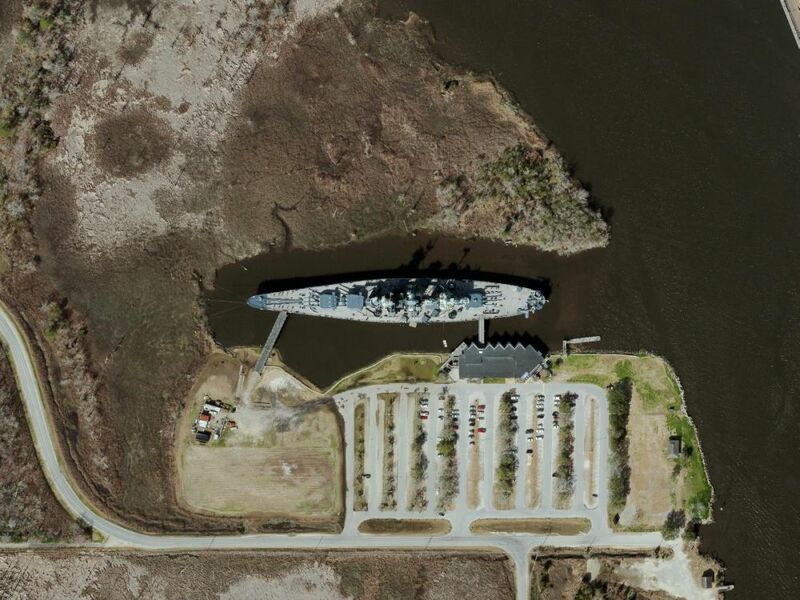 The USS North Carolina is now a museum ship and memorial kept at the seaport of Wilmington, N.C. The North Carolina was laid down on 27 October 1937 at the New York Naval Shipyard and launched on 13 June 1940. This battleship was commissioned in New York City on 9 April 1941, with Captain Olaf M. Hustvedt in command. She was the first of the U.S. Navy’s fast, heavily-armed battleships to be commissioned, carrying a powerful main battery of nine 16 in (410 mm) guns. The North Carolina received so much attention during her completion and sea trials that she won the lasting nickname of “Showboat”. As the first newly-designed American battleship to be built in two decades, the North Carolina was built using the latest in shipbuilding technology. To save weight, the North Carolina was built using the new technique of welded construction. Her machinery arrangement was unusual in that there were four main spaces, each with two boilers and one steam turbine connected to each of the four propeller shafts. This arrangement served to reduce the number of openings in watertight bulkheads and to conserve the space to be protected by the armor plate. The long sweeping flush deck of the North Carolina and her streamlined structure made her far more graceful than earlier battleships. Her large tower forward, tall uncluttered stacks, and clean superstructure and hull were a sharp break from the elaborate bridgework, heavy tripod masts, and casemated secondary batteries which characterized her predecessors. The North Carolina was one of 14 ships to receive the early RCA CXAM-1 radar. The North Carolina completed her shakedown cruise in the Caribbean Sea before the Japanese attack on Pearl Harbor. Early in 1942, the North Carolina was scheduled to steam to Pearl Harbor. However, she remained in the Atlantic Ocean for a few more months so that she would be available to take on the German battleship Tirpitz in the event that battleship began to attack Atlantic convoys carrying war supplies and troops from the United States to Great Britain. The North Carolina was finally ordered to the Pacific Fleet in the summer of 1942. After inactivation, she was decommissioned at New York on 27 June 1947. Stricken from the Naval Vessel Register on 1 June 1960, the North Carolina was transferred to the state of North Carolina on 6 September 1961. She was purchased from the U.S. Navy for $330,000. On 29 April 1962, she was dedicated at Wilmington, North Carolina as a memorial to North Carolinians of all services killed in World War II. This battleship was declared a National Historic Landmark in 1986. Copyright ©2018 Midwest Aerial Photography All Rights Reserved.